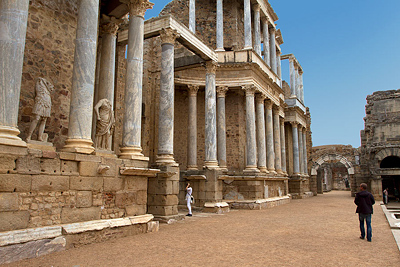 Thanks to the rich history of Extremadura, there are many historical cities and other places of interest. Extremadura knows a number of cities and towns that are more than worth a visit. The first three named below are on the World Heritage List of UNESCO because of their outstanding historical worth. The fourth, Trujillo, is not yet on that list, but that may just happen before long. Mérida is the capital of Extremadura. Throughout Ancient history, it was the centre of Roman culture in South-West Europe. Many remains from that period can still be found in Mérida. Mérida also has a museum for Roman art in which you can get a great impression of the Roman culture from that time. Very impressive is also the Roman bridge, the longest of its kind, across the river Guadiana. There are also a Roman circus and a hippodrome, but specifically the amphitheatre is the showpiece of ancient Mérida. There is much more to be seen here, so it’s easy to spend a full day in this wonderful city. In between you can enjoy tapas or raciones on one of the terraces. The ancient centre in Cáceres is incredibly beautiful. In the Middel Ages the city partly has been rebuild. Many af the Palacios are from that period. The most eye-catching building in Cáceres is the thirteenth century cathedral, right next to the Plaza de Santa Maria. The old city is in use by different governmental services but you will also find a Michelin two stars restaurant here. Different musea are openend from free or just a little money. The town of Guadalupe is a typical Extremaduran town like many others. But in the centre of the town, there is the ancient Basilica of Our Lady of Guadalupe. The basilica is built on the site where a sculpture of the virgin Mary was found. The construction of the monastery lasted four centuries, and it was built in multiple styles. In the basilica, several halls have been furnished as museum, but as the tour goes on, you get more of an impression of the rich religious art, with as highlight the sacristy where a series of paintings by Zurbarán can be admired. Finally, you reach the image of the Lady of Guadalupe. Especially for the Spanish this is an unforgettable experience. Trujillo is built on a hill and can be recognised from a distance by the characteristic castle on top of it. Once in Trujillo, you can find the Plaza Mayor, one of the most beautiful squares in Spain. From there, you can walk to the top of the hill, where you can enjoy a great view across the surroundings, as well as visit the castle. Then, you can wander through the small streets of the ancient city. 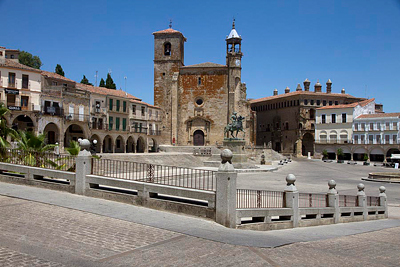 Trujillo is considered to be the small jewel of Extremadura, and the birthplace of several Conquistadores. After the walk, it is also very easy to find good terraces to sit, especially on the Plaza Mayor, where you can enjoy some food and a drink for very little money.